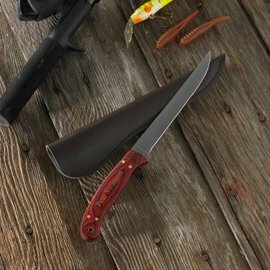 Every fisherman - whether a professional or an amateur - needs a sturdy and reliable filet knife. This personalized knife features a wooden handle, razor sharp stainless steel blade, and a sturdy black faux leather sheath. The gift measures 10 1/2" long with a 6" blade, and is personalized with one line (max of 15 characters).